Around 380 years back, Francis Day and Andrew Cogan bet big on a nondescript coastal land, called Chennappanaikan. This hamlet grew expeditiously and became the commercial and cultural hub called Chennai. As the sands of time piled up, so did the cities transport and related infrastructure woes. Determined to get ahead of its troubles, the Greater Chennai Corporation is proactively working with the ITDP India Programme in the field of sustainable mobility and urban planning. With an ever-increasing population, estimated to be 9.8 million in 2015, Chennai’s urban transport facilities are under immense pressure. The city has been plagued by issues on various fronts, these include: its dubious distinction of road fatalities, recorded to be 1,300 in 2017; soaring motor vehicle registration, which stands at 4.2 million; a shortfall of 2,000 buses which forces its current fleet to run overcrowded. Change isn’t easy in cities, especially since the car is a symbol for status. Knowing this well enough, the ITDP India Programme collaborated with the Chennai City Connect Foundation, in 2009, to highlight the poor conditions of walking and cycling infrastructure. In the years to follow, the city has taken drastic measures to improve the situation and the Non-Motorised Transport Policy validates its efforts. The policy, a first of its kind in India, mandates a minimum of 60% of transport funding to create and maintain walking and cycling infrastructure in the city. 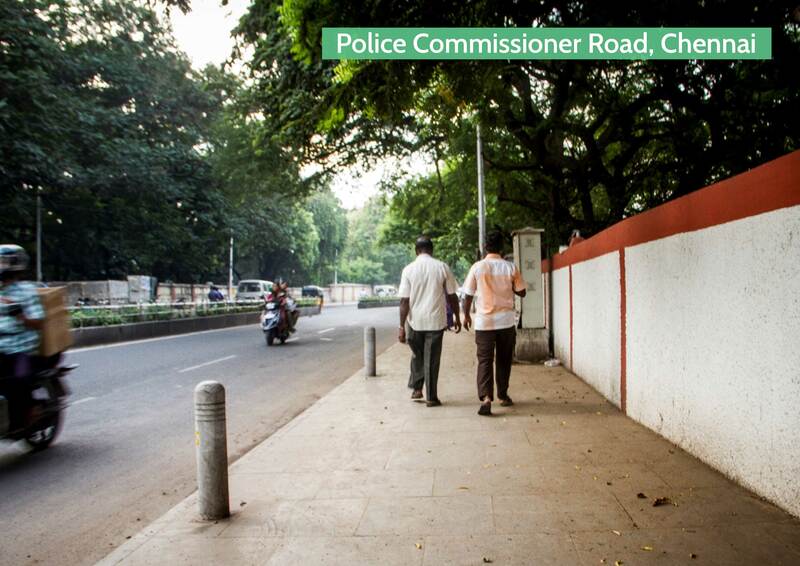 So far, Chennai has retrofitted over 75 km of walkable streets and is redesigning an additional 60 km. Additionally, to support cycling, Chennai is planning a Public Bicycle Sharing (PBS) system with 5,000 cycles. Word regarding the progressive policy soon spread, garnering national and international attention; with cities like Chandigarh and Nairobi interested to adopt similar policies. In 2015, Chennai’s efforts in improving sustainable transport won it the Sustainia Awards. Clearly, a sign of being on the right path. To keep the progress in motion, the ITDP India Programme collaborated with the Corporation to facilitate capacity development workshops in street design for over 200 municipal engineers, design consultants, and road contractors. Next in line was to debunk the misconception that vehicles owned our streets. The ‘Car-free Sundays’ initiative introduced citizens to the concept of enjoying their streets free of vehicles. Chennai is also planning to roll out the carpet for a high-capacity Bus Rapid Transit (BRT) system and a reliable on-street parking management. The feasibility study, for the 120-km bus network, is being worked upon and the India Programme is providing technical input on the same. Additionally, the parking management initiative looks to manage 12,000 car park spaces across the city and help rake in Rs 550 million per year in revenue—a whopping 110 times increase from what it presently earns. For Chennai, overcoming its transport woes is surely a herculean task but modifying its transport culture will offer the much-needed impetus. In all of this, the ITDP India Programme continues to provide technical expertise and match Chennai’s enthusiasm to break new barriers in the field of sustainable mobility.